Last week Streetsblog looked into the suburban real estate moguls who used their public offices to advance the country’s largest sprawl project — Houston’s third outerbelt, also known as the Grand Parkway. But even with all the cronyism and self-deal propelling this project forward, just a few months ago it looked like the Grand Parkway had been stopped in its tracks. The money had run out. The public was balking [PDF]. Then a man named Ned Holmes came to the rescue. A real estate developer, Texas DOT commissioner and prominent businessman, Holmes “found” the $350 million in unbudgeted money needed to move the project forward another 15 miles in its relentless, multi-decade march into the Houston region’s last natural grasslands. In many ways Ned Holmes fits the profile of the government officials that have pushed this project forward in the past: He’s a real estate developer occupying a public office that gives him enormous power to shape the built environment. In his public life, Holmes is a well-known pillar of the Texas conservative establishment. According to the Texas Secretary of State, he is the director of the Houston Baptist University, Associated Republicans of Texas, the Greater Houston Chamber of Commerce, the Greater Houston Partnership and the Governor’s Business Council. In his business activities, however, Holmes keeps a lower profile. He made a fortune in banking, but he identifies himself as a real estate developer, the head of Parkway Investments. As for what Parkway Investments does exactly, it’s hard to know. The company has no website. There is no public record of properties developed. Holmes declined to be interviewed for this story and did not respond to email queries. But he did respond through a TxDOT employee, who said Holmes does not stand to profit in any of his business ventures from the completion of the $5.2 billion Grand Parkway. But the company certainly has a record for actively supporting local politicians. In 2004 alone, Parkway Investments donated $174,000 to a variety of candidates, making Holmes one of the single biggest political donors in the state. In addition to Parkway Investments, Holmes is the CEO, founder or principal of more than a dozen limited partnerships, corporations and associations, according to the Texas Secretary of State. Many of these ventures are equally enigmatic: two bear the cryptic names “NH-10.6” and “NH-5.” An email inquiry to Holmes about the purpose of the companies went unanswered. Because those companies are not publicly traded, Holmes is under no obligation to disclose their activities. The ambiguous nature of these ventures does, however, make it difficult to ascertain whether he is avoiding conflicts of interest as an appointed government official in a leading decision-making role at an agency with a roughly $20 billion annual budget. Meanwhile, in his free time, Holmes has taken an extracurricular interest in the future of transportation. He is the founder and director of the little-known Transportation Transformation Group. Known as the T2 Group for short, this group might be described as the Tea Party’s answer to Transportation for America, although with an annual budget of only about $130,000, of a dramatically smaller scope. On its website, T2’s priorities read like a page out of the House GOP playbook (the website applauds Chairman John Mica’s six-year reauthorization plan, that would have trimmed overall spending by 33 percent and eliminated dedicated funding for bike and pedestrian projects). While Holmes fights to enact his vision of a car-based transportation system nationally, the Grand Parkway serves as a sort of local preview in his hometown of Houston. This spring, leaders in Harris County had thrown up their hands. The county simply could not afford to finance the Grand Parkway. It looked like sprawl interests in Houston had their limits after all. TxDOT agreed to assume responsibility for the project (the whole 180-mile project, not just the 15 miles known as Segment E that are next in line to be built) despite its dire financial straits. ExxonMobil announced its intention to move its North American headquarters to 1,800 acres bordering the proposed Segment E, from its current location 10 miles closer to the city. 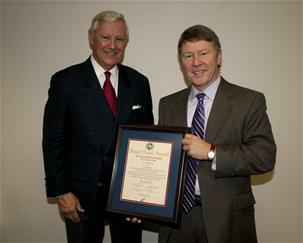 Ned Holmes scoured TxDOT’s books for any available money. With construction costs down during the recession, he was able to scrounge up some $350 million in savings that could be diverted to the Grand Parkway. Jay Crossley of the smart growth advocacy group Houston Tomorrow said he is not aware of a single public statement made in support of Segment E outside of suburban developers and their political allies. He believes public opinion about transportation is evolving and that eventually Texas leadership will be forced to follow suit. Just last year, TxDOT underwent an independent audit. The report identified a “trust issue” between members of the public and TxDOT leadership. “Over recent years, TxDOT has been subject to increasing criticism from the public, from the Legislature, from community leaders and others,” the report stated. The Texas Legislature, however, failed to pass comprehensive TxDOT reform. It sounds like you’re on to something, Angie, although I’m not terribly surprised. Texas has blurred the line between private and public interest fairly effectively. When corruption occurs at the state level, the feds are supposed to go in and investigate. (I know about this because I’ve seen it in the movies.) Where are the US Attorneys and the FBI in Texas? Anyone who thinks bike trails are the answer in Houston should spend a summer there first. It seems Progressive is just another word for naive. There are two Houstons. One is the sprawling Houston that gets all the news and is republican. The other is the walkable Houston within I-610 (called “the loop”) with heavy public transit service and votes consistently democratic. Houston has a leftist city council and mayor. The population density of central Houston is now above 7,000 per square mile. The suburban Houston housing market is in a slump. In central Houston, the rich are pushing the poor out to the suburbs and the price of a house jumps $150,000 over its suburban equivalent. Shotgun houses built in the 1920’s on blocks go for $450,000 just so people can get their hands on the lots. They are called “teardowns” and are replaced with condos right up to the property line. No zoning in Houston. Houston is just the opposite of rust belt cities. No Bus Rapid Transit here, either. 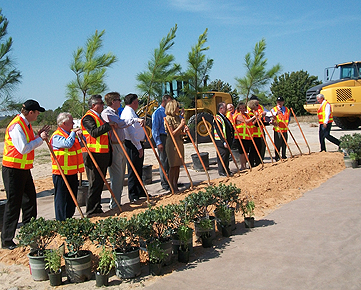 Instead, Harris County Metro is building not one, but three streetcar lines. 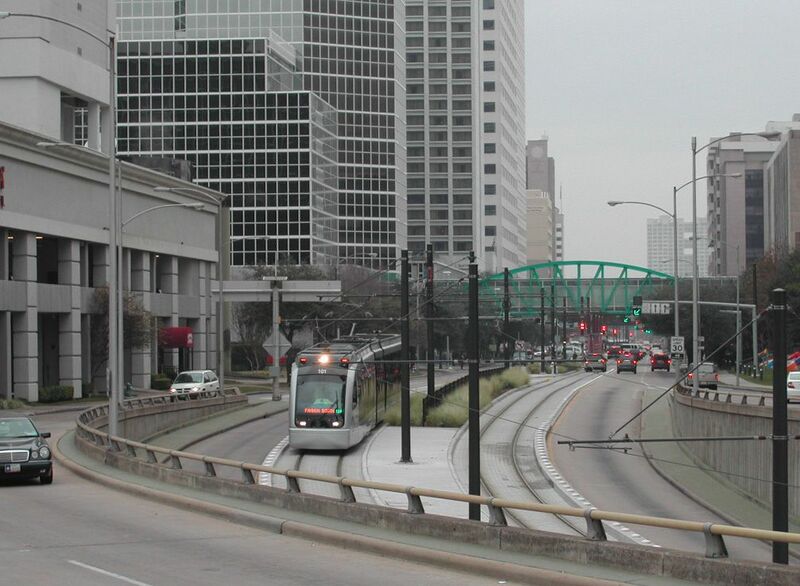 Houston just expropriates 2½ lanes of major streets and lays down trolley tracks. Try doing that in your town and see how far you get. This week, Dallas City Council voted to kill the $1.7 billion Trinity Toll Road project. Angela Hunt had been fighting for that outcome for 11 years.